It may go against the grain, but I believe sole reliance on sampling as diagnostic practice is outmoded. The reason for this view is that these days there are more innovative and comprehensive ways to pick up the problems that lead to corrosion, allowing building managers to have better control of their water systems and quickly react to changes in condition, before bigger problems take hold. While sampling is a recommended method, it does have its disadvantages when used alone. Firstly, sampling provides a snap-shot of the system’s condition. It offers no long-term or real-time analysis and the picture it gives only identifies constituents (typically corrosion debris and bacteria) in the water flowing through a particular point at a particular time. Secondly, the results achieved from sampling can be open to interpretation. If sampling picks up bacteria or corrosion debris in the water, then chances are there are problems, but the results won’t necessarily identify what they are. In many cases chemicals are used to mask the issue, rather than dealing with the problem. This gives rise to another problem, that chemicals may be used where they’re not needed. After routine maintenance, for example, conditions within the water system are disrupted. It’s very possible that a sample taken at this time would give artificially high readings that could lead to a panic reaction; namely the addition of chemicals which could in-fact exacerbate corrosion - the very thing you’re trying to avoid. In general, bacteria should not be the only focus of our understanding of water condition. When bacteria is flowing freely through a closed-circuit system it could be argued that it’s not doing much harm. 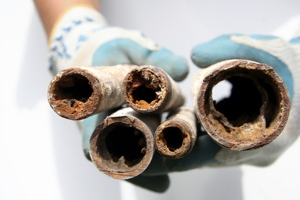 Biofilm, where bacteria adheres to the internal walls of the pipework, is the point at which it becomes corrosive. Biofilm won’t coat the whole system because it’s localised, which makes it hard to detect during the sampling process, so a reading showing zero or low levels of bacteria could be just as misleading. Another problem with sampling is that there’s a timelag between the sample being taken and getting the results. Sometimes it’s a number of days, but it can be as much as a matter of weeks. By the time the lab returns the readings, the situation’s very likely to have changed. Sampling often relies on consultants to review results and make recommendations. The cynic might argue that the interpretation of results could err on the side of caution. And, sampling results alone very rarely take into consideration the mechanical and engineering set up of the systems in question. The main issue I have with sampling is that it doesn’t detect the very thing that is a pre-cursor to most corrosion problems, be they microbial or otherwise - oxygen. Without oxygen corrosion cannot occur; it causes degradation directly; and creates a more favourable environment for bacteria to thrive. I am not advocating no sampling at all, because it can be indicative of system health, but it shouldn’t be relied upon as the only assessment. Modern technology offers an up-to-date approach that gives building managers a clearer picture of what’s really happening in piped systems, and allows them to take more appropriate responses. 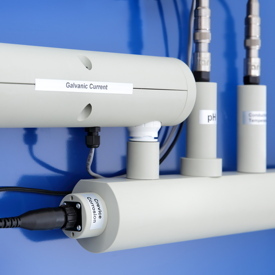 Sensors enable 24-7 monitoring of a system in real-time. They allow a range of parameters to be checked, including oxygen. This means that small changes in system condition can be flagged up, leading to problem solving rather than simply masking with chemicals. For example, higher dissolved oxygen levels and a change in pressure suggest there’s a leak. With comprehensive results to hand, the building management team is often able to repair the situation itself, saving time and money. A very important point to note is that monitoring of a water system should begin during pre-commissioning cleaning and continue throughout its life, covering pressure, pH, temperature and corrosion rates – all signifiers of system condition. 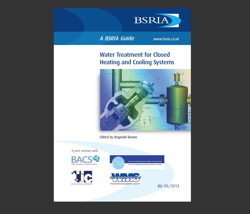 BSRIA’s Guide BG 50/2013: Water treatment for closed heating and cooling systems ‘provides an introduction to current theory and practice of water treatment in closed systems, including minimising the risk of corrosion through system design features and proactive monitoring’. The Guide covers the key elements around water systems that designers should consider, such as system design, installation, testing and pre-commission cleaning. While not regulation, the Guide offers helpful insights for those who have responsibility for closed systems, providing a framework for establishing and operating a maintenance programme that best suits the building’s needs. The Guide covers both chemical water treatment methods and nonchemical treatments. The Guide can be bought from the BSRIA bookshop. Last year, Guardian Water Treatment used its Hevasure product to help diagnose the cause of chronic leaking in the LTHW system at Telephone House, a large office building in central London. BSRIA samples showed the system’s bacteria, iron and solid levels fell within the expected range but, despite this, the leaks continued. Guardian installed the Hevasure 24/7 monitoring unit to provide a three-month health check, which pointed to falling pressure on the building’s fourth floor, leading to a spike in oxygen levels – the cause of the corrosion. As the monitoring results were so clearly linked to a specific location and a specific cause, the building’s maintenance team was able to identify expansion vessels and pressurisation units that needed to be replaced. Once these were fixed, continued monitoring showed that pressure levels within the system quickly returned to normal, oxygen levels also fell and the leaks stopped. As failed water systems can run into the millions in terms of cost of repair, this approach offers a cost-effective and modern solution to water monitoring. The rest of a modern building is monitored in this way through a BMS, isn’t it time that water systems followed suit?